The in-laws of a young woman strangulated her with a noose after she had failed to bring Rs 50,000 as dowry. The parents of the deceased have lodged the report in village Kallu Garhi with Mussori police station. The Delhi Police today gunned down a dreaded criminal after a brief encounter in South district. The deceased has been identified as Suleman, alias Sulla, a resident of Mangol Puri. The newly elected president of Delhi Pradesh BJP, Dr Harshvardhan, has said that the Sheila Dikshit Government must “detoxify itself first” of corruption and ill-governance before pointing an accusing finger at the Opposition. “Aa to nahi rahe hain par unka man bhi nahi lag raha,” exclaimed an aide of Shiromani Akali Dal Delhi President Paramjit Singh Sarna, who called on Rajasthan Governor Madan Lal Khurana at Jodhpur House this evening to wish him on his 68th birthday. The Municipal Commissioner, Mr Rakesh Mehta, has assured that there would be no vultures and other birds in and around the abattoir, which is under construction in Ghazipur in East Delhi. The abattoir will be fully air-conditioned, derived from modern technology imported from Germany. The Delhi High Court today summoned the Secretary, Urban Development Ministry, and the Delhi Government Health Secretary for failing to take a decision on the representation of a private hospital, which wanted to pay for changing the lease condition from “charitable” to “commercial”. The response generated by the first Dilli Haat, an upgraded version of the weekly village bazars, showcasing at one place the rich Indian folk culture, cuisine and crafts, has paved way for a second of its kind in the city. A four-day Divali Mela will be organised by the District Red Cross Society at the grounds of Sector-12 here from October 28 to 31. On the occasion of World Sight Day 2004, Bausch and Lomb launched a nationwide school health campaign to create awareness on eye care, in association with DPS RK Puram. Next time when you approach any dotcom for marriage, first check the credentials of the person you are approaching, otherwise you might fall into a trap! This is what happened with one Anasuya Mohan who placed her advertisement for marriage in shadi.com. With the arrest of two persons, the Delhi Police claims to have busted a gang that was active in selling spurious injections in the city. The police have recovered around 6,200 spurious injections. The in-laws of a young woman strangulated her with a noose after she had failed to bring Rs 50,000 as dowry. The parents of the deceased have lodged the report in village Kallu Garhi with Mussori police station. Sadiq of Secunderabad had married his daughter Samer Jahan, 23, to Farooque of Kallu Garhi. Since the marriage, the man and his parents had been harassing Samer Jahan for more dowry. Samer’s maternal uncle Dalsher said soon after her marriage, Samer was given Rs 24,000 by her father for a scooter and a sum of Rs 65,000 was given to Farooque for a plot of land. However, Farooque had been demanding Rs 50,000 more. Samer was often beaten up brutally to bring the money from her parents. On Wednesday, the in-laws of Samer had put a noose around her neck and strangled her. They did not even inform the parents of the deceased. Her parents were informed on phone by someone else. When the relatives came from Secunderabad, Samer’s in-laws were ready for her burial. The police were informed immediately. Samer’s husband Farooque, brother-in-law Jaan Mohd and sister-in-law Rahes have been named in the FIR. The police have sent the body for autopsy. Some unidentified persons stole Rs 1 lakh of a leading tractor manufacturing company in Noida’s posh Sector-18 market in broad daylight. The money was kept in the scooter dickey. The money belonged to New Holland Tractor Company. Two employees had taken out the money and were on their way to make payment to a dealer. Shri Nath Yadav and Inderjit, employees of New Holland Tractor Co in Greater Noida under Bisarakh police station, had come to withdraw Rs 1 lakh from ICICI Bank in Sector-18. After withdrawing the money, they put it in the scooter dickey. Shri Nath Yadav then went to LIC office for his personal work, Inderjit was sitting on the parked scooter. But when Shri Nath Yadav came, they noticed that the dickey lock had been broken and the money stolen. They immediately informed the company and the police. 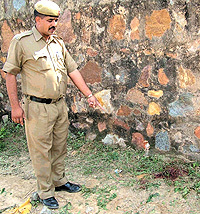 The police of Sector-20 immediately reached there and started investigation. The Delhi Police today gunned down a dreaded criminal after a brief encounter in South district. The deceased has been identified as Suleman, alias Sulla, a resident of Mangol Puri. The police killed him at Aaya Nagar area near Mehrauli today. Suleman was wanted in connection with several murders, extortion and robbery cases. The Delhi Police received a tip-off that Suleman was scheduled to visit South district to commit a robbery on October 15. The police were also informed that some of his associates would also be accompanying him on this mission in a gray Santro car. The police laid a trap at the spot. Seeing the police, Suleman allegedly opened fire at the police party and in return, the police also fired at him. Suleman received bullet injuries during the encounter. Suleman was rushed to the AIIMS where he was declared brought dead. His associate, however, managed to escape during the encounter, taking advantage of the adjoining dense jungle area. Meanwhile, the police have launched a manhunt for his associates. Suleman, a former student of Rajdhani College, took to crime after coming into contact with a criminal, identified as Rajesh Rathi. Thereafter, he committed several robberies, murder and other heinous crimes. The police had arrested Suleman in January 2004 on charges of robbery committed in the Punjabi Bagh area. However, he was released on parole after his son drowned. Suleman, thereafter, jumped the parole and the police was on the lookout since then. The Delhi Police today seized a large quantity of fake ISI-marked bottled drinking water carrying Bisleri brand label during a raid. The raid was conducted along with a team of the Bureau of Indian Standards. The police raided the premises at Tilak Nagar and Ashok Nagar and found them possessing and storing fake ISI-marked bottled water. The police have also seized a large quantity of drinking water, including mouth caps, holograms, stickers and shrinking plastic film with Bisleri brand printed on them. The raid was conducted during a special drive launched by the BIS to curb the sale of spurious ISI-marked products. With the arrest of two persons, including the wife of the deceased, the North-West district police today claimed to have worked out the murder case of an MCD employee at Barwala village in August. The police said the accused Chadan Singh was having an affair with the wife of the deceased, identified as Roshini. When the victim Ram Karan objected to their relationship, his wife Roshini and Chadan Singh hatched a plan to kill him. Incidentally, Ram Karan and Chadan Singh were employed in the MCD and were friends. On the fateful day, Chadan invited Ram Karan at his house and got him drunk. Later, Chadan took the victim to the Sukhi Nehar and killed him. Subsequently, he threw the body in the canal. The police recovered the body from the canal in a highly decomposed state. During interrogation, Roshini confessed her crime and disclosed the name of Chandan Singh as the main culprit. Meanwhile, the police arrested Mohammad Hasan alias Ajuba and Mohammad Ikhlaq in connection with the murder case of a vegetable vendor in Bhalsawa Dairy in September. The newly elected president of Delhi Pradesh BJP, Dr Harshvardhan, has said that the Sheila Dikshit Government must “detoxify itself first” of corruption and ill-governance before pointing an accusing finger at the Opposition. Dr Harshvardhan, who was declared elected for a second term this evening, claimed that the Congress had failed to give to the people of Delhi an efficient and responsive dispensation. “All the important plans for development of India in general and Delhi in particular were initiated by the BJP … those plans have either been terminated due to political malice or have been put aside. The Congress party is revengeful,” he told The Tribune soon after the returning officer, Chaudhary Nihal Singh, declared him elected as president of Delhi Pradesh BJP. “It is shameful that the UPA Government should want to detoxify institutions of repute or change the school curriculum or, for that matter, threaten to change governors and political appointees,” he told this newspaper. He went on to question the performance of the Sheila Dikshit Ministry and cited issues like statehood, Master Plan, unauthorised colonies and industries to buttress his claim. “The NDA had proposed to change the Master Plan and levy user charge in return for regularising unauthorised colonies. The Congress opposed then. We proposed statehood. They backtracked. The chief minister has thoroughly deceived the people … there is no excuse for not doing anything when you have the Congress in power in the state and at the Centre,” Dr Harshvardhan said. Dr Harshvardhan was today formally elected to the post, nearly nine months after he was entrusted with the job. The 50-year-old practicing doctor, the only candidate in the fray, polled 62 out of 69 votes. Born 13 December 1954, Dr Harshvardhan joined medical school in Kanpur after completing his primary and secondary education in Delhi. He is alumnus of Ganesh Shankar Vidyarthi Memorial Medical College, Kanpur. A former health and education minister of Delhi, Dr Harshvardhan was appointed president of Delhi Pradesh BJP in January after Madan Lal Khurana quit the post owning moral responsibility for BJP’s poor showing in December 2003 Assembly election. He is a member of the Delhi Legislative Assembly. He represents the Krishna Nagar seat in the 70-member House. Meanwhile, in a related development, the party has elected Vijay Kumar Malhotra, Sahib Singh Verma, Jagmohan, Vijay Goel, Lal Behari Tiwari and Anita Arya to the BJP National Executive. A former mayor of Delhi, Mr Shanti Desai also was elected to the National Executive. The central observer, Mr Shivraj Singh Chauhan, scrutinised the nominations and found them in order. “Aa to nahi rahe hain par unka man bhi nahi lag raha,” (He is not coming to Delhi but he is not happy in Jaipur either) exclaimed an aide of Shiromani Akali Dal Delhi President Paramjit Singh Sarna, who called on Rajasthan Governor Madan Lal Khurana at Jodhpur House this evening to wish him on his 68th birthday. Mr Sarna was one of several of Mr Khurana’s friends and well-wishers who descended on his residence in Kirti Nagar in the forenoon and Jodhpur House in the evening. Another prominent Sikh and a member of the Delhi Legislative Assembly, Mr Harsharan Singh Balli, was also present to extend his heartiest greetings. Sources close to the Khuranas said a ‘Havan’ (religious ceremony) was performed in the morning, in which only the close family and friends were present. “It was a private affair,” they said, although a large number of people had gathered by the end of the ceremony. Mr Khurana then distributed sarees and clothes to the poor. The Governor retired to Jodhpur House for lunch before attending a Bhajan Sandhya at Kirti Nagar in the evening. Mr Khurana refrained from making any comments in general and political in particular. Among the first to greet him was Chief Minister Sheila Dikshit, who spoke to him on telephone. Political circles in Delhi were agog the last fortnight with rumours of Mr Khurana deciding to step down as Governor of Rajasthan and return to Delhi to reverse the decline in the party’s fortunes. The speculation about Mr Khurana’s return to active politics compelled the apex leaders of the party to intervene and issue a denial. He did not share the misgivings about the threat to IAF’s Hindon air base from vultures and other birds, pointing out that Ghazipur area already has a landfill site, where all kinds of rubbish is dumped. Besides, there are meat processing units in Sahibabad that are close to Hindon air base. The authorities should have voiced their concern about these industries, too, as they may attract birds to the Hindon base. Nor are there any plans to shift the abattoir site to Gulaoti, Muzaffarnagar or Aligarh. These areas are far from the national Capital and if the slaughterhouse is shifted, it would affect the cost of meat. If anyone has any objections, he should approach the court. The corporation is not authorised to shift the site of the abattoir, Mr Mehta added. The Municipal Commissioner also said that the MCD had signed an agreement with the Microsoft Corporation India to impart computer training to 12,000 teachers free of cost in schools run by the corporation. The teachers, in turn, could impart proper training to students. At present, the corporation has six such training centres in the Capital. In each centre, 10 teachers are given training daily for six hours. The programme will last for five years. The company, which provides free computer education to schoolchildren in different states, has undertaken the programme under its India Education Programme Project “Shiksha”. The project will train teachers so that they themselves become facilitators and executors of computer education. The commissioner said that the MCD had introduced computer-aided learning in its schools through the project “Sharda” from this year. At present, 500 municipal schools have computer-aided learning centres. The software for this purpose has been obtained from Rajya Shiksha Kendra, Bhopal (formerly Rajiv Gandhi Shiksha Mission). When asked that instead of providing computers, the authorities should have distributed jerseys and school uniforms among the students, the Municipal Commissioner said that uniforms have already been distributed. Jerseys, too, will also be distributed very soon. The Leader of the Opposition, Mr Subhash Arya, said that the corporation should have power connections in schools located in remote areas of the Capital. Without power, computer education cannot be imparted. A number of schools in the Capital do not have water and power connection, he said. “No action has been taken since the September 23 order,” a Division Bench comprising Chief Justice B. C. Patel and Justice B. D. Ahmed observed while directing the two officials to appear in person before the court on November 18. On September 23, the Bench had asked the government to take a decision within a fortnight on relaxing the lease conditions for the land allotted to private hospitals in the Capital at throwaway rates by which they had to reserve certain percentage of beds for the poor. A Public Interest Litigation (PIL) filed by Social Jurist, a group of lawyers, had alleged that several private hospitals in the Capital, which were allotted public land at throwaway prices on condition of providing free treatment to the poor, were not doing so. A committee formed to look into the affairs of the private hospitals had found some hospitals were not adhering to the lease conditions, particularly when it came to reserving beds for the patients of weaker sections of society. The Escorts Heart Institute & Research Centre Ltd., (EHIRC), which was allotted land on the same condition, had informed the court that it has offered to pay Rs 51 crore to the DDA to get rid of the lease condition and the proposal was under consideration of the authority. The DDA had said the proposal has been put before the Urban Development Ministry. The EHIRC has proposed to pay the difference between the market price of the land prevailing at the time of allotment and the concessional price at which the land was allotted. However, the Social Jurist had objected to the proposal, saying the land given through a charitable society has to be used for charitable purpose. The first Dilli Haat, a joint venture of Delhi Tourism and Transport Development Corporation (DTDC) and the Municipal Corporation of Delhi (MCD), was set up in the 1990s in the heart of the Capital opposite the INA market with the basic purpose of providing an infrastructure to urban and rural craftsmen and folk artistes to showcase their art. A more modernised Dilli Haat, equipped with improved and additional facilities, is coming up in Pitampura in North-western part of the Capital. The second Dilli Haat will have more parking space and some air-conditioned restaurants, which the current one does not have. Efforts will be made to bring at one place the kaleidoscopic view of the Indian life, the officials said. For the project, 7.2 acre land has been acquired, which will cost Rs 16 crore. The existing Dilli Haat is spread out in an area of six acres, they said. Preliminary estimates have been made and the plan finalised by the architects for the market. The work on the project will begin any day now as soon as formal clearance from the MCD and DDA is received, they said. The work will take at least one-and-a-half year to complete. In a Dilli Haat, the handicraft and food stalls are allotted on a rotational basis to craftsmen from various parts of the country, usually for fifteen days, to ensure that different handicrafts are available to visitors at each visit. The INA Dilli Haat, a captivating amalgam of craft, cultural activities and multi-cuisine, has turned out to be a great favourite with tourists, especially foreign ones, visiting the Capital. According to the society officials, the mela will be a part of the programmes that the society holds annually. The fair will have about 75 stalls for shopping items and eatables, besides some fun rides for the visitors. Termed as Divali Utsav, the society has claimed that the earnings from the mela will be used for the various schemes of social development. It is reported that the society has already booked about 40 stalls and asked for more applications from the trading and business houses. On the occasion of World Sight Day 2004, Bausch and Lomb launched a nationwide school health campaign to create awareness on eye care, in association with DPS RK Puram, New Delhi. An eye care session was conducted for the youngsters studying at DPS RK Puram. It began with a free eye check-up by well-known ophthalmologist Dr Samir Sud and concluded with a talk by him on eye care. Representatives of Bausch and Lomb and DPS School spoke of their responsibility to help create awareness on eye care. A recent study conducted by Bausch and Lomb and AC Nielsen indicated that 45 per cent of people who require vision correction are not even aware of it. Such surveys play a vital role in giving us the latest figures on the eye care condition in the country. “It is imperative to spread the message of eye care across the people in India. Bausch and Lomb looks forward to conducting similar workshops and sessions with the children all over the country,” said Mr J P Singh, Managing Director of Bausch and Lomb, India. Mrs Shyama Chona, Principal, DPS RK Puram and Mr Narendra Kumar, Chairman DPS Society, addressed the audience at the session and acknowledged the good work being done by Bausch and Lomb in eye care and appreciated the ideology behind the school health campaigns. Next time when you approach any dotcom for marriage, first check the credentials of the person you are approaching, otherwise you might fall into a trap! This is what happened with one Anasuya Mohan who placed her advertisement for marriage in Shadi.com. Instead of getting married to the person she chose, she had to lose $39,000 for the treatment of the mother and sister of the so-called NRI Akhil Mukherjee. Anasuya did her graduation in Electronics and Telecommunications from India in 1988 and went to Duke University for further study. 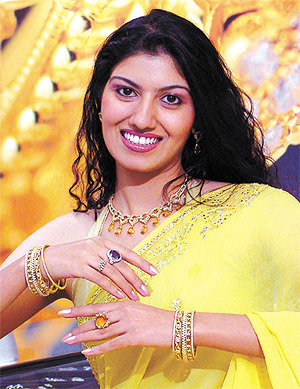 In 2003, she placed an advertisement in shadi.com for marriage. In March 2003, she got a response from Akhil, who claimed to have done graduation from London School of Economics. He also claimed to be a green card holder and said that he was earning US $ 1,50,000 to $ 2,00,000 per annum working as a business consultant. After some time, the ‘NRI’ asked Anasuya to pay $ 39,000 that he required for the treatment of his mother and sister. Anasuya, oblivious of the truth, sent the money to him through Western Union Money Transfer. After getting the money, Akhil did not respond on Internet. Suspicious, she informed the police. During investigation, the police traced the accused, who happens to be one Akhil Mukherjee (30), a resident of Deshbandhu Appartment, Kalkaji. With the arrest of two persons, the Delhi Police claims to have busted a gang that was active in selling spurious injections in the city. The police have recovered around 6,200 spurious injections. The accused have been identified as Surender Kumar (30) and Mahesh Singh (24). Both the accused were earlier working as salesmen in Bhagirath Palace drug market. After quitting their job, the accused started selling the injections in Baljeet Nagar, Nagloi and Mangolpuri areas. For this purpose, they sought the help of one Vijay Kumar Mittal, who was running his medical agency in Bhagirath Palace. They purchased the injections from Vijay Mittal for Rs six and sold them for Rs 20 to Rs 30 per piece, the police said. The main customers of the accused were youths from middle-class families. According to DCP Narcotics, D. L. Kashyap, “The shocking factor in the seizure is that earlier these injections were confined to only the slum area of Yamuna Pushta belt, but now they have graduated to the middle-class youths and are bent upon spoiling their lives.